Although demand for local food in the Bay Area is on the rise, most small farms struggle to stay afloat. But a new student startup called Farmcation, which grew from a UC Berkeley School of Public Health innovation course called “Eat. Think. Design,” is working to connect local farmers with urbanites who want a taste of rural living and are willing to pay for it. Founded by Grace Lesser, a business and public health master’s student, and Caitlyn Toombs, who graduated in May with a master’s degree in business, Farmcation isn’t just a promising business model; it’s a way of bringing people together. The seeds of Farmcation began to sprout last summer when Lesser and her then-fiancé moved to her family’s farm in western Massachusetts, where they grew an acre of vegetables and raised 65 chickens to serve to their 240 wedding guests later that August. Through the process of growing and providing their own food to guests, Lesser not only saw firsthand how powerful food can be in building community, but also realized just how much work small-scale farming takes. When Lesser returned to Berkeley in the fall, she and Toombs set out to create a platform that linked food-curious consumers to local farmers seeking extra revenue. Although it’s a mutually beneficial relationship, it’s a connection they say doesn’t always happen on its own. They came up with Farmcation. 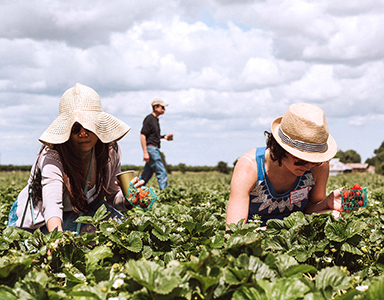 At a recent test event for the startup, now in beta, visitors traveled to an organic family farm in the Central Valley, where they took a tour with a farmer, picked strawberries and ate a picnic lunch prepared by chefs from a San Francisco restaurant. These are the types of experiences, Toombs says, that will bring people closer to the food they eat, the land it’s grown on and the people who produce it. Farmcation plans to finalize its business model this summer.